Good news for all Pyle lovers, the latest Pyle PSUFM1235BT is now available for pre-order. The upcoming Bluetooth loudspeaker Karaoke system comes with power packed features and a macho look. Pyle, the well-known brand for superior quality audio systems and top class designs, coming up with one more product offering to increase its market share. Here is our Pyle PSUFM1235BT Review to explore the new model’s features, specification and see how this models stands in competition. If you are looking for a PA speaker from a reputed brand, read further. 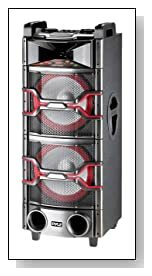 Powered Active tower speaker with stunning looks. Powerful 2400-Watt sound output with built-in 12” dual woofers and Horn tweeter. Frequency Response of 45Hz-20kHz. Comes with wireless microphone for Karaoke and audio recording. Striking DJ Flashing with multi-color LEDs. Built-in FM radio tuner. USB and SD Memory card inputs. The latest model PSUFM1235BT power-packed with useful features and groundbreaking loudspeaker. If you’re new to PA speakers, what you should know is that the PA speakers come with built-in power amplifier and crossover. PA speaker systems are easy to setup and start using; you just need the speaker, power source and a sound source. This Bluetooth wireless loudspeaker tower is ideal for DJ party nights as this model comes with multi-color flashlights and sing-along karaoke function. Flashlights can be switched off when you don’t need them. The device has wireless range of up to 50 feet and works with Bluetooth enabled smartphones and other gadgets. This Pyle PA speaker has audio controls on top panel that includes volume, Echo, Bass and Treble controls. The system also comes with a wireless remote control. You will also get a wireless microphone with this unit. The model also has ¼” microphone input, if you do have one more wired mic. Apart from wireless streaming, the Pyle PSUFM1235BT also supports RCA (L/R) aux input, USB and SD card up to 32GB. The High-Powered Active Speaker tower comes with built-in FM radio tuner for uninterrupted music entertainment. Overall, the new Pyle PSUFM1235BT could potentially become a perfect companion for party-nights. Along with party flashlights, the PA speaker produces powerful sound output. With maximum power output of 2400 watt, the speaker is capable to produce 128dB of Sound Pressure Level (SPL). If you don’t have budget to invest a huge money on complete home theater setup, this PA speaker that comes with built-in woofer and tweeter, could be a right choice.